This oven is a nice oven, it has all the settings I need to make all of my baked foods. I really like how it has around four or five settings like toast, bake, broil, and also keep warm. It is very easy to clean also. The exterior is easy to clean and the knob settings are also easy to use, it looks great. The top temperature is around 400. Even Heating The toaster oven also has even heating it makes my cookies come out perfect. It takes around five minutes to preheat. Safety It is very safe and I noticed it gets very hot when it is in use, so I don't think it is a good idea to touch the oven when your baking something. Ease of Cleaning The ovens exterior is very easy to clean, a wet cloth should work just fine. The inside tray is removable and the rack is also. Durability It is light and can be moved by one person and it is very stable when in use. Design It is a very nice oven, it is silver and it looks great. The exterior is silver which is easy to clean and the interior is also easy to clean, a wet cloth should work fine. This is a lot larger than my last toaster oven, but if you have the room for it, it'll come in handy. It's a little hard to make sure it's off because it doesn't make a sound to indicate it has finished, but I like how quickly it cooks. Make sure to keep an eye on your food as it'll burn easily. I really like the crumb tray - cleaning it is a breeze. 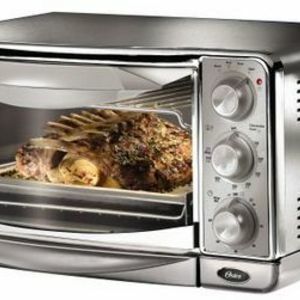 This Oster toaster oven does anything you would want in an oven! I've had this Oster toaster oven for nearly two years now and it has stayed with me strong throught the entire time. And this is impressive because I use the oven nearly every day for my cooking needs. The great thing about the Oster oven is that it is so small that it can fit on any kitchen surface. I like to put mine in the corner for accessibility. The toaster heats up very quickly so that I can get my dinner or lunch prepared fast in my busy day. Also, I like the fact that there are many options to cook such as broil, convection, toaster, and warm. Also, there are temperatures settings that you can adjust for your cooking needs. The one I don't like about this toaster is that it can get dirty very easily. If I am toasting bread, I always get crumbs falling into the cracks. If I add cheese to the bread, it makes it even worse because the cheese drips and is very difficult to clean. Also, I don't like the fact that the oven can be a little confusing to get the right settings. Other than that, this oven cooks very well! I love toaster ovens. I am a busy mom and I often make biscuits in the morning for the kids breakfast. I love not having to turn on a big oven for 4 little biscuits. Because I live in an apartment, I have various colored appliances in my kitchen, but the brushed stainless steel goes with everything. It is so easy to clean. The first thing my son noticed was how clear the glass in the door is and he could stand there and watch the food. I should also mention that there is no warm-up time. 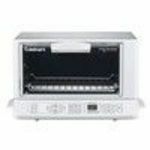 when you turn on the convection oven you can place your food inside immediately. And the food cooks faster. At first I was slightly disappointed that this model wasn't digital but then I realized that digital is not always better. Digital displays burn out or just stop working. Being a mom or growing kids, I have come to realized that in this age of disposable everything, sometimes simple is better. The last toaster oven I had is still working eleven years later. I can only hope that this one last that long or longer. 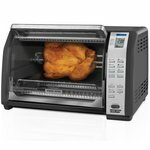 Love the Oster Toaster Oven's Convection Cooking! OK, so I admit it - I'm not a big fan of toast. This oven was purchased to heat things like pizzas without having to turn on the large oven. I have a toddler and his eating habits are extremely varied, to say the least, so often we need to reheat food or make something that he will eat. I have had the oven for almost six months and I use it almost every day. I love the convection feature and find that food cooked in the oven is much tastier than in the microwave. Let me refute what I have seen mentioned as cons in the reviews here and on other retail sites: * I have it sitting on my kitchen counter, and yes, it does take up a good amount of space. Don't get it if you don't have a place to put it. * We don't set things next to it, we don't set things on top of it, and we don't touch it when it is on so we haven't had any issues with it burning fingers or scorching nearby items. We have not had any incidents where it seemed to get too hot or has stopped working. * The controls work well and we don't have any problem using a dial instead of digital controls. * The convection fan makes some noise but it is certainly not obnoxiously loud nor does it impede conversation while standing near it. 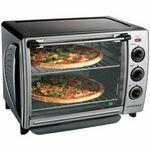 We would really recommend this oven for cooking small meals and heating up foods like corn dogs, chicken nuggets and pizzas. Looks great on the counter and cooks my pilsbury items to perfection - they rise so much more than the last toaster oven I had. Having convection is a plus. This was a gift from my mother - who hated my old toaster oven and after using this one I know why. This one works faster and heats up so much nicer. I am never going to buy any other brand than Oster if I ever have to replace this one. Best part about it is that you can still do toast and it isn't hard for anyone to figure out how to make toast. I didn't have to tell my 8 year old how to work the controls she just figured them out on her own - which is a great plus. 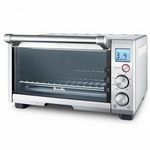 We've had the Oster 6297 6-Slice convection oven for about a year now and over all we are pretty satisfied with it. We had searched around looking for a toaster oven when we decided on the Oster. We were looking for a good oven which had the convection feature, could toast, could bake medium sized items (like a pizza), didn't take up much counter space and looked nice. We decided to on the Oster because it seemed to have all the features we wanted and had a relatively low price. We had heard a lot of horror stories of Toaster ovens going bad and starting fires. Oster has a pretty good reputation from the reviews we read regarding safety. After a year's use here are the pros of the Oster: - The convection works as advertised. Food comes out crispy and fairly evenly cooked. - The oven uses less power than our old toaster. I measured with a Kill-o-watt. - The oven is easy to use and we've yet to have a problem with its reliability. - The oven is easy to clean and take a part. - The slide out tray pulls forward with the door which makes it easier to take things out without burning yourself. Cons: - There is no way to turn off the convection feature. So you can end up with over-dried toast if you are not careful. - The oven DO NOT hold 6 slices of bread. We've had to settle for 4 slice toasting and taking turns. This would only matter for families.I does hold a medium pizza. - The settings are analog- this and the small size are probably the major disappointments of this device. Next time we would buy an oven with digital controls. It's too easy to set the wrong setting early in the morning :( Overall, we are happy with our purchase. I am deducting 1 start for the fact that this oven only holds 4 slices of bread. This is about the 5th Toaster Oven that I have bought. It is also the best one I have ever bought. I could not believe how quickly and evenly it baked potatoes. 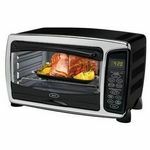 (Much better than a microwave and almost as fast) It is a fabulous appliance that I would purchase again. We have owned this toaster oven for a few years, and I am so pleased with it! there are three dials on the front of the unit. One for the oven temperature, one for a timer, and one to set what setting you would like (warm, bake, broil, toast, etc.) It is necessary to set the oven carefully, because if you set the oven, but forget to turn on the timer then the oven will never heat up. But this can be learned easily! I have baked all kinds of things in this oven with success. I use it mostly for making garlic bread on broil, and warming leftovers on warm or bake settings. The timer is great, because you can set to warm bread and ensure that the oven will turn off before the bread burns if you put it in and forget about it. The crumb tray is also a great feature. It makes it really easy to slide it out and rinse or wash it in the sink and replace it whenever necessary. This oven serves so many purposes and saves energy because you don't have to heat a full oven for small items.